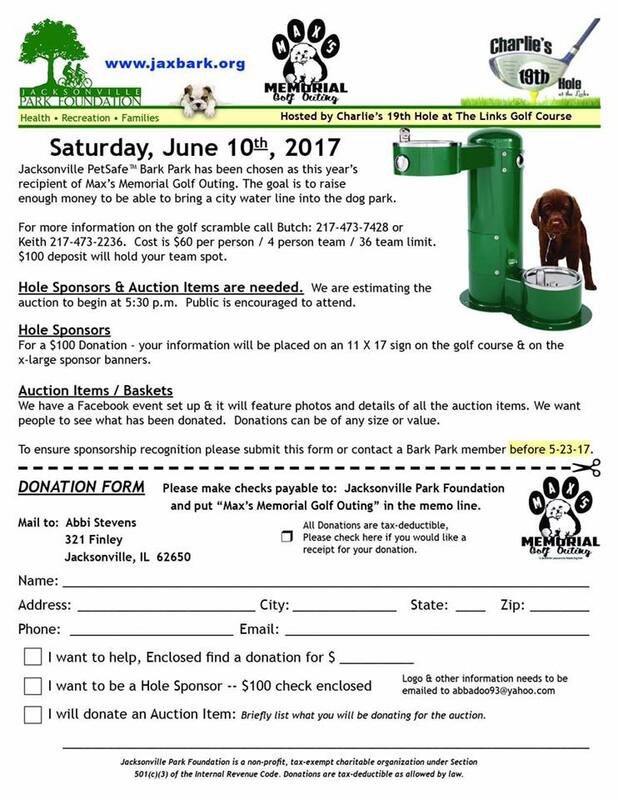 Thanks to Butch Wood and Charlie’s 19th Hole, money from his annual fundraiser will go to putting in water features at the Jacksonville PetSafe Dog Park. Dubbed Max’s Memorial Golf Outing & Auction, the event will start noon Saturday June 10 at The Links in Jacksonville. GOLF – Sign up by calling Butch 217.473.7428 or Keith 217.473.2236. $60 per person, 4 person scramble. Limit 36 teams. $100 deposit, rest due at event. Noon tee time. AUCTION/PARTY- Everyone’s invited in the evening for food, fun and to bid on fantastic auction items starting at approximately 5:30. Check the event page to see what’ll be up for bid. If you’d like to contribute auction items or find out how you can help, message the Bark Park Initiative of the Jacksonville Park Foundation via Facebook. Event info easily accessible at jaxbark.org. Please help in our goal to bring water features (fountains, dog wash, dog spray) to the dog park. Get the word out to golfers via jaxbark.org. Help us find auction items (form). Recruit people to come to auction. The Bark Park Initiative of the Jacksonville Park Foundation is a nonprofit, tax-exempt charitable organization under Section 501(c)(3) of the Internal Revenue Code. Donations are tax-deductible as allowed by law.